Here we are on day three of this month's release peeks at There She Goes, which puts us SO much closer to the release!! We are LOVING your enthusiasm about the previous two sets we revealed, and can't wait to see what you think of today's set!! Last month we released the new Enjoy Life set with matching dies, and THIS month, Melyssa has created a set full of stamps to go along with the dies!! From crabs, to sand castles, oysters, and octopi, this set will help you use the Enjoy Life dies to there fullest!! For my card, I decided to use last week's Mojo Monday sketch. LOVE IT!!! 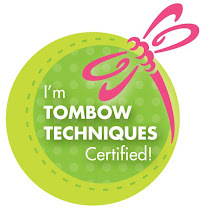 I'll definitely be using it again. The DP is a mish mash of Sassafrass, Bella Blvd and Bo Bunny. The image was cut out using the Enjoy Life Die (released last month), stamped in Versafine Onyx Black and then watercolored with Tombow Markers. Enjoy Life-By the Sea is a 4x8 set that includes a total of 25 stamps and will sell for $18.00. Would you like to win the new Enjoy Life-By the Sea stamp set? Here is what you need to do- visit the Trendsetter’s blogs that are participating in each of the blog hop challenges below and comment on their creations as you go. 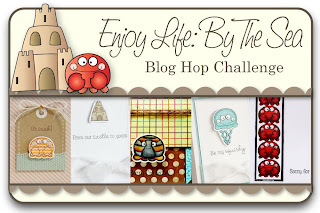 One of the Trendsetter’s blogs (from each hop day) will be randomly chosen as the ‘it’ blog and a winner will be picked using a random number generator from the comments left on that Trendsetter’s Blog Hop Challenge post. You will not know which blog has been chosen so the more you comment on the better your chances are of winning new stamps! 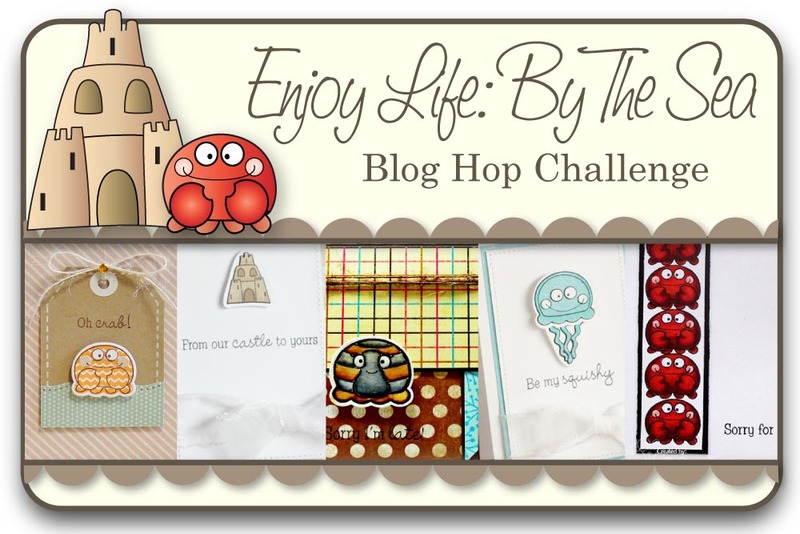 The Blog Hop Challenges will be open until 5 PM Eastern Time Saturday, August 25th with the winner being announced during the release party chat. Great card--I like the mix of papers and layout and of course the cute image. love this sweet little image. very cute. Oh that's so cute =) TFS! What an adorable snail...very cute card. I love the little snail on your card! So very cute! Nice! I love the set last month, and this one is just as cute, if not cuter! So cute! Love this little guy! This is such a creative little set to go with the enjoy life dies! So much fun, I love this! Love that ice cream scoop, I mean snail!! Cute!! 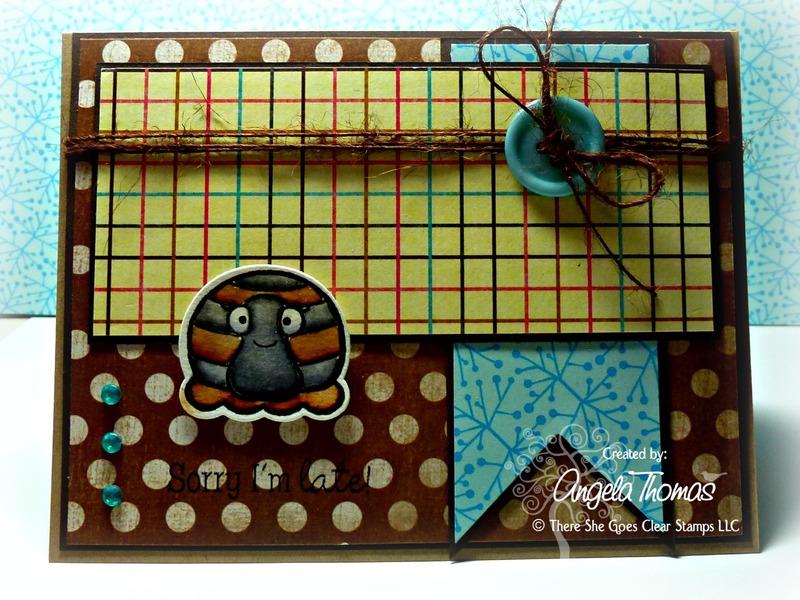 great color combo...this is perfect for a boy card! That snail is way too cute!! I love how you colored him. I love the patterns ou used. 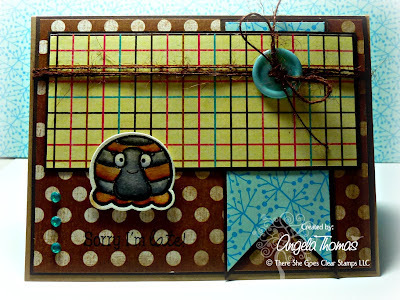 cute little snail and i also love the lo of your card! !